Hawaiian Honey Bread and Red Star Yeast - Chocolate Chocolate and More! And I love getting things for free. A few weeks back, on Facebook, Red Star Yeast had a post about a free yeast giveaway. All I had to do was Like them, which I already did and share their post about the giveaway. So Blah, blah, blah, about a week later I got the e-mail that I won. and then about another week later, this came in the mail. Here’s what I want to tell you all. If you like using a product, yeast, chocolate, flour, sugar, whatever. LIKE them on Facebook. You’ll find out about new products, recipe ideas, sales and yes, giveaways! Now I know I’ll never win a brand new car by liking Chevy or Ford on Facebook but I’m more than happy with receiving free yeast with all the Holiday baking about to commence! So Thank you Red Star Yeast! In a large mixing bowl, combine 2 1/4 cups flour, yeast, dry milk and salt, stir to blend. Add to flour mixture, blend, just to get it started combining. Knead on floured surface until smooth and elastic. Place in greased bowl, turning to grease top. Cover, let rise in warm place, about 15 minutes. Punch down dough. On lightly floured surface, shape into a round loaf. Place in greased 9 inch cake or pie pan. Cover and let rise again for another 15 minutes. Combine egg and 1 tablespoon of water and brush over top of loaf. Bake at 375 degrees for 35-40 minutes until golden brown. Remove from pan to cool. This bread was wonderful, great flavor and it took less than 2 hours total (including rising, twice) to complete. 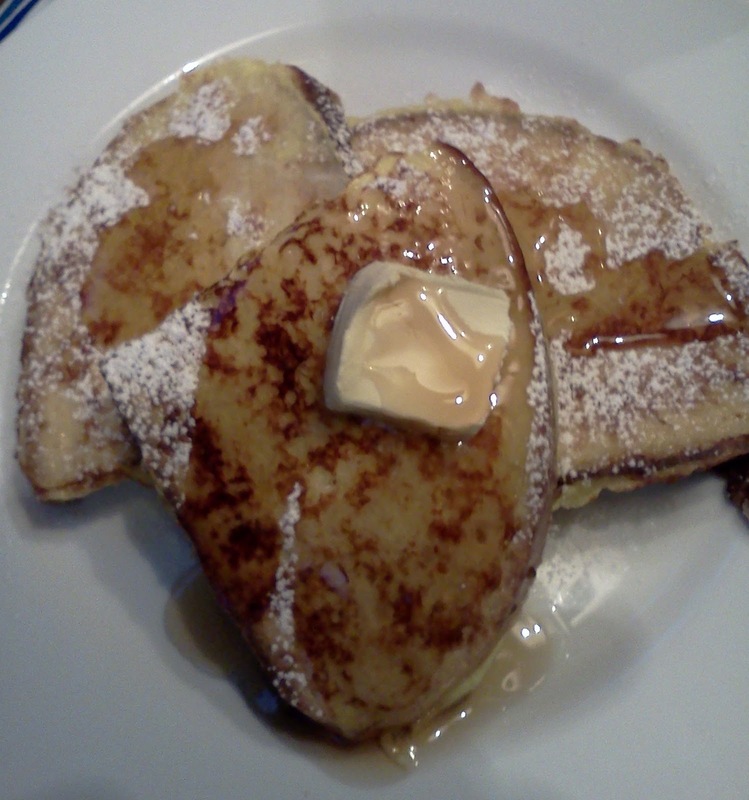 And it was even better as French Toast! You’re very welcome! So glad you’re enjoying the prize and that you made one of our recipes. The French toast is a great idea! And to think I got all hyped up with excitement over those cream cheese bars! It looks perfect. Like, almost not real. But I know it is. It’s just that perfect. LOL Mark, just be sure to wipe off your keyboard, and much better to be visiting a blog when hungry than a grocery store! Oh my gosh that bread sounds so good! I bet my kids would totally flip for this one.